Our calendars tell us it’s the first day of Spring 2019 and warmer days ahead — or the first day of Fall and cooler days for our friends in the Southern Hemisphere. In either case, both are absolutely wonderful seasons, each with their own special delights to be grateful for. Speaking of time, we’re overdue for a grid-based tangle IMHO. Peeks is from Texas CZT Leslee Feiwus who shared her Moonesque tangle with us not long ago. “Peeks is an easy and fast tangle that just uses straight lines. 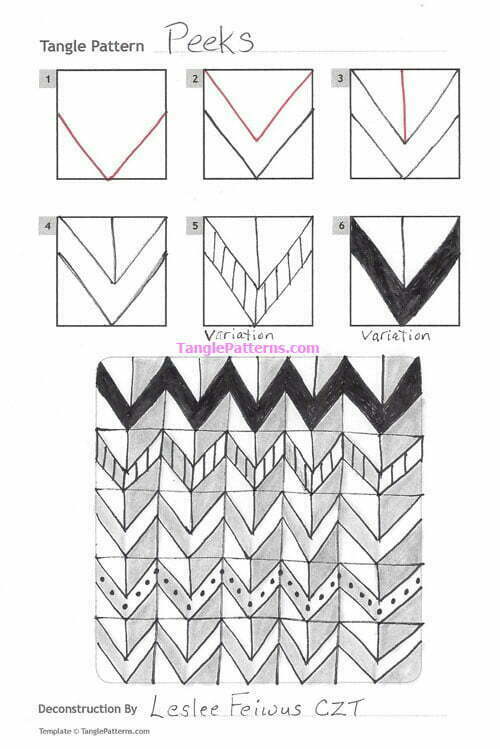 You can add whatever additional patterns you want into the chevrons to make it uniquely yours. You can morph it or leave it all the same size. Love the synergy between your Peeks and Moonesque tangles, Leslee. Looks easy and fun, thanks, Leslee! I have drawn it and I like it: easy and lots of possibilities! A fun and easy one. I’m into easy at the moment!